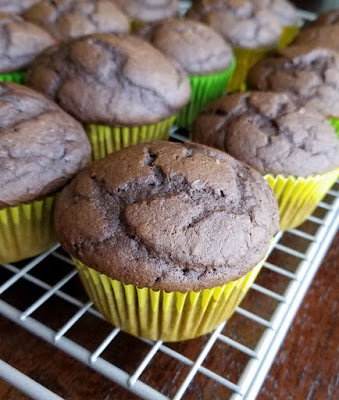 Chocolate cupcakes made simply with a cake mix and super soft and moist with pumpkin. Just a hint of spice lets you know that your fall cupcake dreams have come true! 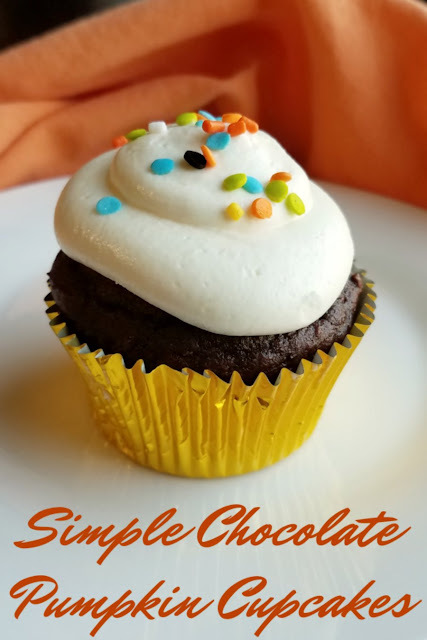 Super simple to make and full of flavor, the chocolate pumpkin cupcakes have something for everyone to love! 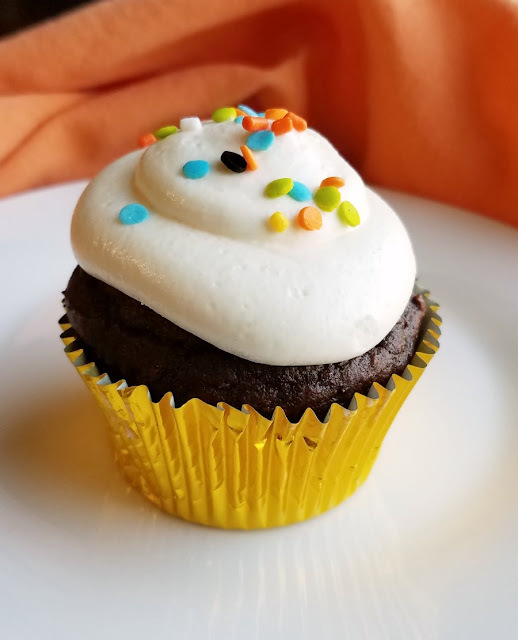 Whip up a batch and make your favorite frosting and sink your teeth into a delicious bite of fall! These cupcakes really do have something for everyone. 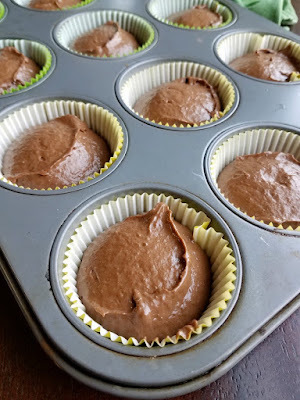 They start with a chocolate cake mix, so they are crazy easy to make. Even people who consider themselves "not a baker" can bake these. There are so few ingredients and steps, it would be hard to mess them up! The texture is fabulous. Sometimes chocolate cake can be a bit dry and bland. There is nothing worse that looking forward to chocolate goodness and being disappointed. That is not going to be an issue with these. They are moist and flavorful. They have a perfectly soft crumb that begs you to take another bite. There is just a bit of cinnamon spice to them which really adds something. It lets you know this isn't just any chocolate cupcake, this is more! MiMi has been mixing cake mixes and cans of pumpkin for years. She almost always used a yellow or angel food cake mix though. She also baked them in a 9x13 and we always enjoyed it. If I remember correctly, sometimes she did a little drizzle of glaze or a bit of streusel too. Made plain, it really doesn't get any more simple. I figured if it worked so well for her, I could put a spin on it and make a chocolate version! Little Dude and I have been on a cupcake kick. I *may* or may not have waaaaay overbought cupcake liners when ordering for his Grinch cupcake birthday cake and my brother's wedding cupcakes. He loves picking out the colors to use and loading them in the cupcake tins. He also likes scooping the batter and licking the spatula. But who doesn't love that?! So we decided to make cupcakes! To make sure they held together, we decided to stray a bit from the nothing but a cake mix and can of pumpkin formula. A few Eggland's Best eggs and tablespoons of oil helped keep them moist, and gave them structure enough to hold those perfect cupcake domes. Under that dome is the softest chocolate cupcake! We tried piping some whipped sweetened condensed milk frosting on top. The creamy taste was great, but the frosting is too soft to hold it's shape. At least not like the American buttercreams I'm used to! I should have known better. It is a lot like ermine frosting, which I love but wouldn't pipe with! I'd still recommend trying it and just schmearing it on with a knife rather than piping it. Or schmear on some cream cheese frosting! If you want something pipable, I'd recommend sweetened condensed milk buttercream, chocolate buttercream, or Italian meringue buttercream. So put a chocolate cake mix on your grocery list and plan to make a batch of these this fall. Your family and friends will thank you! Want a more true chocolate flavor? Leave out the cinnamon and nutmeg! Don't want cupcakes? Just bake the batter in a 9x13" pan, using the directions on the back of the box to estimate the baking time. 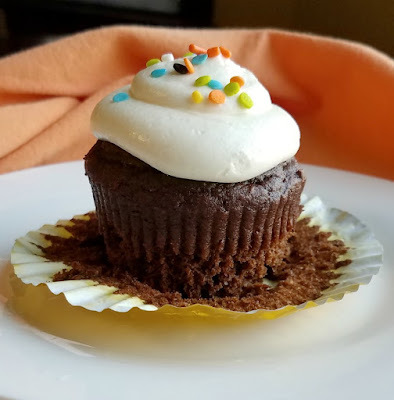 Chocolate cupcakes make simply with a cake mix and super soft and moist with pumpkin. Just a hint of spice lets you know that your fall cupcake dreams have come true! Preheat oven to 350F and place paper cupcake liners in 18 cupcake wells. Beat on low until combined. Scrape bowl to ensure everything is incorporated. Beat on medium for 2 minutes. Bake 20-22 minutes, or until the top springs back when lightly touched with a finger. Remove from cupcake tin and place on wire rack until completely cooled. I love the way the frosting looks on this cupcake. Kind of relaxed instead of all staunch and uptight. Adding cinnamon and nutmeg to the batter is a great idea! Happy pumpkin week! Oh my yumminess!! Can you believe I am not doing Pumpkin Palooza this year? I just have so many other recipes brewing that I didn't want to do 4 weeks of pumpkin. But I shall be making these cupcakes for the crew! Perfect...like you!! Happy Monday! I love chocolate and pumpkin together! And who doesn't love a cupcake? These look awesome, Carlee! Thank you so much, Kelsie! That means a lot coming from you! If you didn't mention that the frosting was hard to pipe, I would have never known. They are adorable with the sprinkles and candies. You could make it pipable easily enough, but I tend to like stiffer frostings when piping. It is delicious though, so don't let it deter you from making the frosting for something! We love pumpkin recipes and cupcakes! I can't wait to make these. Thanks for sharing at Merry Monday! It's hard to beat when you combines two of your favorites in such a simple recipe! These are adorable and i love the chocolate + pumpkin combo! These look delicious! So very festive. I have a bad habit of overbuying cupcake liners too! It's just so easy to do! I do love pumpkin and your chocolate pumpkin cupcakes look delightful. Aren't they so good together? Thank you! A great way to start a fall morning! I love pumpkin anything! Probably my favorite is pumpkin bars with cream cheese frosting. I love how moist the bars are! Yes! Pumpkin bars are fabulous! Yum. I’m so in the mood to bake all that is pumpkin starting pumpkin pecan dump cake. My very fav pumpkin recipe to bake is my pumpkin bread. I bake it all year round, whenever the craving hits and it's my Mom's fav too! Thanks for giving the emailer's a chance to win too...very appreciative! Pumpkin bread is one of our favorites too! I love pumpkin ravioli. I also love pumpkin chocolate chip loaf cake. My pumpkin favorites are: pumpkin pie, pumpkin cheesecake, and pumpkin spice latte. I love pumpkin cheesecake and one of my favorite pumpkin dishes. 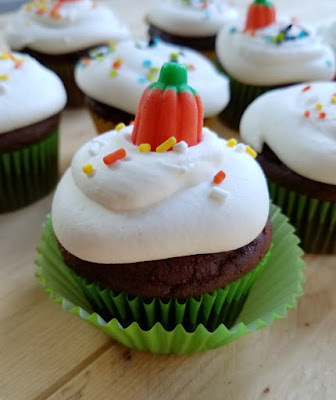 You can never have to many cupcake liners, this recipe looks delicious and thanks for posting all those wonderful pumpkin recipes from other blogs will have to look at them all. Pumpkin is my favorite. Fall is such a wonderful time of year for baking just hate what's is coming after fall. Not so much a winter fan here. You're right, I should get more! And I'm with you, winter can take its time getting here! 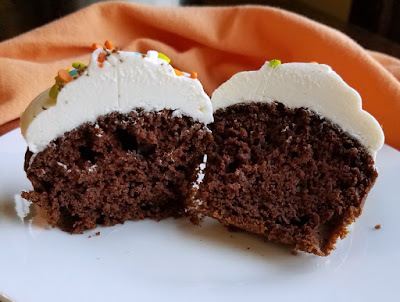 I have a feeling that this chocolate pumpkin cupcake will be our new favorite pumpkin recipe. Right now we are eating a snickerdoodle pumpkin bread that tastes fantastic! Pumpkin anything is great in my book! Wow, I really want to try to make these, just love pumpkin, it's my favorite flavor for Fall season and I love chocolate all year long! I love Pumpkin loaf with a smidge of butter. A couple of pumpkin recipes I like are pumpkin bread, roasted pumpkin wedges and lentil pumpkin stew. Congratulations! This post is being Featured at the new Merry Monday Party starting Sunday evening! Sharing on social media! A real winning combination for this awesome cupcake! Thanks so much for sharing your post with us at Full Plate Thursday and hope you have a great week! Sounds like a perfect fall cupcake! Oh YUM! I bet the pumpkin and cinnamon really enhanced the flavor of the chocolate cake. Thank you so much for sharing these with us at the Whimsical Wednesdays Link Party! Chocolate Pumpkin? I bet those are so moist!! They look lovely! Thanks for sharing on Celebrate 365 Blog Party's Cake and Cupcake Party! They really are so good and plenty easy! Another winning flavor combination! Thanks for sharing at Celebrate365 Chocolate party.